For some it's just the town that you drive through on your way to other, bigger places. For the 1,880 plus residents it is their home, way of life, and community. It’s Everywhere USA by most standards. You might pass through while getting off interstate 88 and fill up at the only gas station or grab a bite at the only sit down restaurant, The Tulip and the Rose. It’s cradled in the foothills of the Catskill Mountains, right along Ouleout Creek, a branch of the Susquehanna River. This is the town you come to, to raise your children away from the hustle of the city. It’s where you come to retire, or on the weekends to escape to the peace of the countryside. It is also one of the many small rural towns across America facing the national debate over hydraulic fracturing, also known as "fracking". 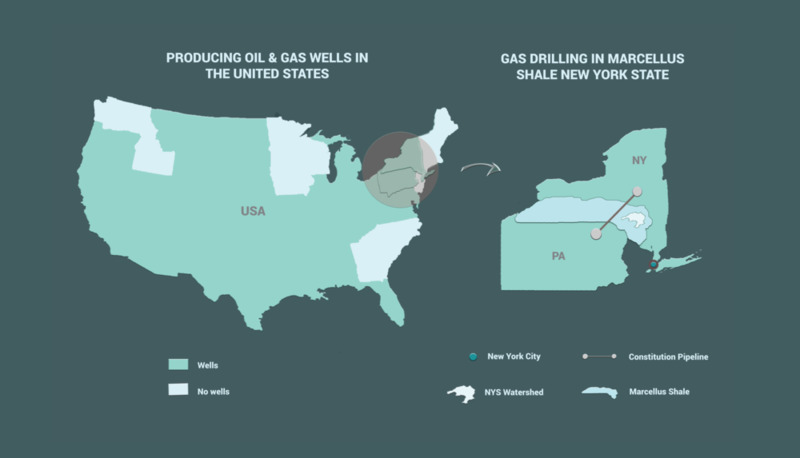 Despite New York’s recent ban on fracking, many fear that the introduction of The Constitution Pipeline and other natural gas infrastructure will lead to future fracking. The pipeline has seen a significant amount of pushback from the community. The compressor station, which will be located two miles from Franklin Central School, is being fought by a group called Compressor Free Franklin. The pushback has delayed the construction of the Constitution Pipeline by over a year. With 4,000 letters going out to the DEC to reject the pipeline, it is uncertain what the future holds for this small town. Cindy Beach is a homeowner just outside of the town of Franklin. She is a member of both the Compressor Free Franklin group and Stop the Pipeline. Cindy fought to prevent the pipeline from going through her property but will still be affected, if it’s approved. Even though she was able to keep the pipeline off of her property she had no say in the compressor station which will be located about a mile from her house. Not everyone in the area is anti-fracking or anti-pipeline. Constitution Pipeline has promised jobs to the local community and a payoff to homeowners who sign a contract with them. Franklin is located in Delaware County, one of the poorest counties in New York State, having once been primarily an agricultural area. Jim and Ruth Sickler are homeowners who have signed a contract agreement with the pipeline. While the Sicklers have received their payoff from the Constitution pipeline company, there is still a lot of uncertainty for them with the addition of the second pipeline. In the works is also a second pipeline. It is a 33 inch, high pressured pipeline called the Tennessee Pipeline which will run parallel to the Constitution if approved. This pipeline also requires a 20,000-50,000 horsepower compressor station which has been slated to be put in the town of Franklin. The Constitution is a 30 inch high pressured pipeline that is proposed to carry fracked gas from Pennsylvania through New York. This pipeline has already been approved by FERC (Federal Energy Regulatory Commission) and is now waiting on the approval of a 401 water quality permit from the DEC (Department of Environmental Conservation).